The Palais Theatre, St Kilda was constructed in 1927 as the Palais Pictures, to a design by prominent Sydney-based theatre and cinema architect, Henry E. White. It was built on leased Crown land for the American entrepreneurs, Herman, Harold and Leon Phillips, who had previously established Luna Park (1912) and the Palais de Danse (1913) in St Kilda. The Palais Pictures building replaced an earlier Palais Pictures which was built c1920 and destroyed by fire in 1926. It was designed to seat up to 3000 patrons and incorporated generous backstage facilities and a broad proscenium. Like its predecessor, the form of the new Palais Pictures conformed to that of the adjacent Palais de Danse, with the adoption of a curved, aircraft hangar-type structure. The Palais Theatre is a free-standing, rendered, concrete encased steel frame building, with brick infill walls. The roof is a two level, shallow-curved corrugated iron roof, supported on steel trusses. Extensive use was made of steel framing, with the dress circle cantilevered from a steel frame, to minimise the number of columns required in the auditorium. The highly visible side and rear facades of the free-standing building have minimal decoration, placing emphasis on the front facade. Conceived as a signboard, the central section of this main facade incorporates a large descriptive sign on a curved, rendered parapet. Domed towers flank the facade in a similar manner to the Luna Park entrance and the Palais de Danse facade. Wanting to convey a sense of modernity, Henry White stated that he adopted no particular style in the design of the Palais Pictures building. The interior, described at times as Spanish, French and Oriental, includes a large, double-height entrance foyer with giant order columns, and two sweeping staircases to the dress circle foyer above. Walls are decorated with a disc-like surface pattern and columns have a scagliola finish. Two open wells in the upper foyer, a rectangular one over the lower foyer and an elliptical one over the back stalls, are an important aspect of the design. The internal early/original decorative scheme of the Palais Theatre, designed mainly by Melbourne firm A.E. Higgins, is substantially intact. The interior of the Palais Theatre is adorned by a variety of lighting, including candelabras, wall lamps and illuminated glazed panels. The lighting is either part of the A.E. Higgins decorative scheme or is part of a suite of light fittings manufactured for the Palais Theatre by Victoria's pre-eminent manufacturer of lighting and hardware, William Bedford Pty Ltd. Some of the William Bedford light fittings are now located off-site. A switch/power board located in the dome originally controlled the lighting in the theatre. The place also contains an array of original and early service equipment and some remnants of orchestra pit balustrading that contributes to an understanding of how the theatre originally operated. After World War II some alterations were made to the building to enable large live performances. 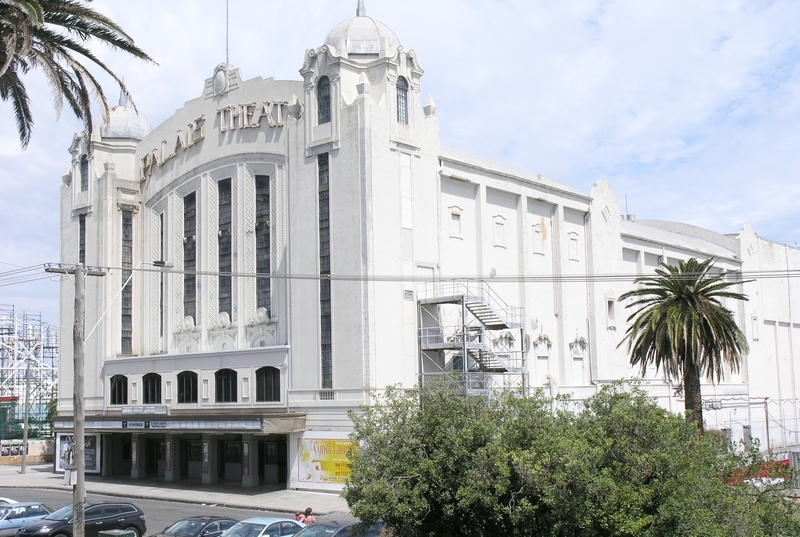 The Palais Theatre subsequently became home to the Elizabethan Theatre Trust's ballet and opera seasons, and home to the Melbourne Film Festival from 1962 to 1981. Affected by the opening of the Arts Centre theatres in the 1980s, the use of the Palais Theatre became sporadic, and it has been used largely as a live music venue since this time. In 1973 the outdoor promenade to the upper foyer was infilled across the front facade, significantly altering the building's external appearance. The Bedford lights are significant to the cultural heritage significance of the place and in their own right. Certain items within the building contribute to the heritage significance of the place but do not warrant registration in their own right. Their contribution relates to the intactness of the building and its rarity, being directly related to the principal function of the theatre. There are differing levels of significance of such contributory items. The following items contribute to the significance of the Palais Theatre to a high degree: tip-up theatre seating (seats bolted to the floor in rows). foot warmers and attendant piping, row of illuminated glazed panels to rear of stalls, wall mounted usher's seating, illuminated exit signs, iron swivel rods for door drapes to stalls fire exits, main front stage curtains with counter weights, ropes and all fittings,leadlight wall mounted light fittings,carved timber bench seats (large), arm chair style seating (lounge), built in balcony moulded spot housings, dome (bio box) switch/power board. White Rose boiler, power generator for projection room (different circuit not in use), switch/power board, various power plant (some not in use), ventilation system (in use), sections (various lengths) of balustrading from orchestra pit, lengths wall drapes and fittings. The Palais Theatre, St Kilda is of architectural and historical significance to the State of Victoria. The Palais Theatre, St Kilda is of architectural significance as a relatively rare, and substantially intact, example of a large scale, free standing 1920s picture palace. The general intactness of the exterior and the retention of original internal decorative schemes, including original lighting and applied decoration, furniture and fittings, enhances its significance. The Palais Theatre, St Kilda is of architectural significance as an example of the work of prominent and influential cinema architect, Henry E. White. It was his largest theatre project in Melbourne and the only theatre designed, rather than refurbished, by him in Victoria. The early/original decorative scheme and the furniture and fittings, mainly designed by Melbourne firm A.E. Higgins, enhance the significance of the theatre as does the suite of William Bedford light fittings (some of which are now located off-site). The Bedford lights are significant as they were specifically designed for the Palais Theatre by a pre-eminent manufacturer of lights and because of their rarity due to the intactness of the suite of lights. The Palais Theatre, St Kilda is of historical significance for its association with the development of St Kilda as an important seaside resort and as an integral part of the St Kilda foreshore entertainment complex. Its vast scale and solid construction reflect the confidence in the location and the medium of film, by the 1920s. The Palais Theatre, St Kilda is of historical significance for its continuous association with a major form of popular entertainment in the twentieth century. This includes its original association with American entrepreneurs, the Phillips brothers, and its continued operation through the 1960s-1980s when many other amusements in the vicinity were closed, demolished or burnt down. As Executive Director for the purpose of the Heritage Act 1995, I give notice under section 46 that the Victorian Heritage Register is amended by including the Heritage Register Number 0947 in the categories described as Heritage Place and Heritage Objects. 1. 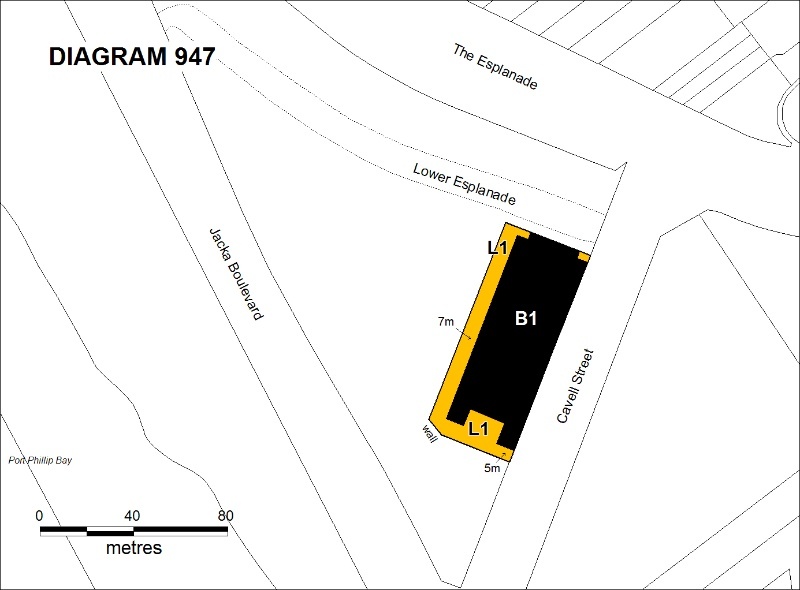 All of the land marked L1 on Diagram 947 held by the Executive Director, being part of Crown Allotment 2002 at St Kilda Parish of Melbourne South. 2. All of the building B1 marked on Diagram 947 held by the Executive Director. 3. The objects known as the William Bedford Light Fittings listed on the inventory held by the Executive Director. The Palais de Danse was first constructed on the present site of the Palais Theatre in 1913. Two years later it was converted to a picture theatre, however reverted back to the Palais de Danse c1920, when the building was re-erected on the adjacent site. At this time a new Palais Pictures was constructed on the original site. The present Palais Theatre was erected in 1927 as Palais Pictures,and designed by Henry E. White, a prominent architect of the day. The site was originally occupied by the Palais de Danse, established in 1913 by H.F. & L. Phillips - the founders of Luna Park and general managers of Palais Pictures Pty Ltd.The Palais de Danse was converted into a picture theatre in 1915 despitew its success as a ballroom. In 1926, while alterations were being made to the building under the supervision of Walter Burley Griffin, the building accidentally destroyed in an electrical fire. The new building erected on the site opened on November 11th 1927. Seating almost 3000 people, the Palais Theatre was at this time the largest picture theatre in Australia. Source: Catrice, D., "Cinemas in Melbourne 1896-1942"
All works including demolition and internal modification to structures should be referred to the Executive Director to determine whether a permit is required (save for the specific exemption above). Note: Signage and site interpretation products must be located and be of a suitable size so as not to obscure or damage significant fabric of the place. Signage and site interpretation products must be able to be later removed without causing damage to the significant fabric of the place. services that uses existing routes, conduits or voids, and does not involve damage to or the removal of significant fabric. Any proposal to undertake such work should be submitted to the Executive Director, detailing the proposed colour scheme, paint type, details of surface preparation and paint removal involved in the repainting, for approval. The purpose of the Permit Policy is as a guide only in assisting when considering or making decisions regarding works to the place/objects. It is recommended that any proposed works be discussed with an officer of Heritage Victoria prior to them being undertaken or a permit is applied for. The purpose of the permit exemptions is to allow works that do not impact on the heritage significance of the place/objects to occur without the need for a permit. Works other than those mentioned in the permit exemptions may be possible but will require either the written approval of the Executive Director or permit approval. It is important that any proposed changes to the place/objects are considered on the basis of clearly defined plans and must be carried out in a manner which prevents damage to the significant fabric of the registered place/objects. It is recommended that before any changes are proposed, the Conservation Management Plan prepared by Lovell Chen (2006) which refers to the building and objects be consulted. It is policy that in determining an application for a permit involving the Bedford lights consideration be given to keeping the lights together as a suite of lights so far as is possible.